While you want to eat a healthy diet, it is not always easy. Squeezing fresh juice at home is time consuming and can quickly become expensive. If you want juice in your diet, one of the cheapest options is juice from concentrate. Depending on the brand you use, this may be a fairly healthy alternative to the more costly raw, fresh juices. Juice from concentrate basically applies to a juice where the water content has been removed. Depending on the brand, the juice does not have added sugar or preservatives. The company just expels all of the extra liquid so that the concentrated juice can be stored safely until you need it. Juice from concentrate is often available in a frozen form. When you want to drink it, you use water to turn it back into a juice when you need it. Since juice from concentrate is fairly cheap, it is a popular alternative to fresh juices. While this may be true, concentrates are not always good for you. Like anything else, it depends on exactly what went into the juice and if extra sugar was added to the mixture. There is no direct answer to this question because it all depends on the type of juice that you are using. The nutritional value of the same apple juice can vary based on who makes it. Some companies add sugar or preservatives to their juices, which makes them far less healthy for you to consume. Juice from concentrate can be good for you, but it has to be made right. If it contains 100 percent juice, then it should be just as good as having fresh juice. You should be able to get nutrients like potassium and vitamin C from drinking the juice. Potassium can help lower your blood pressure and prevent cramps after a work out. Meanwhile, vitamin C can help boost your immune system and make it easier for your body to heal after you develop a bruise. With that said, there is such a thing as too much juice. Fruits are naturally high in sugar. When you juice fruits, then you are basically making a concentrated form of their natural sugars. 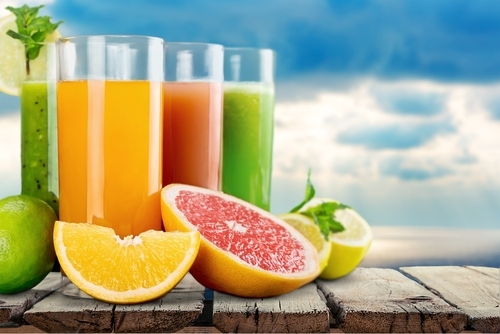 As long as you are drinking juice in moderation, the health benefits outweigh the risks of having these sugars. If you are trying to drink only juice, you may develop health problems as a result. When buying a juice from concentrate, your first goal should be to watch out for added sugar. In the past, this was typically refined sugar that was added to the juice. Now, much of the sugar is probably from high fructose corn syrup. Before you buy any juice, make sure to read the label carefully to make sure that the juice was not made with a bunch of high fructose corn syrup or added sugar. Try to buy a brand that uses 100 percent juice. While juice can be good for you, you do not want to replace your normal fruit intake with juice. Fruit contains fiber, and this fiber is typically lost when they are turned into a juice. In addition, it is easy to drink a lot of juice, which means that you could end up gaining weight if you switch to juices instead of fruit. To make sure that you are making a healthy choice, make sure to look for a few of the following things when you are buying your juice. This term means that the fruit juice was heated up to a high temperature two times to kill any bacteria in it. Then, it was immediately frozen to ensure a long shelf life and no bacteria. Even if the label says that it is 100 percent juice, check the label to make sure that no additives, sugars or chemicals were added to the mixture. Heating the juice can kill some of the beneficial enzymes, so you may want to try cold-pressed juice instead. This process allows more of the vitamins, minerals, antioxidants and enzymes to remain in the finished juice. Raw juice is great because it means that the juice has not been processed in any way. As long as there wasn’t any sugar added, you should be able to enjoy beneficial enzymes and vitamins from the juice without a problem. Just make sure to consume raw juice quickly because bacteria can form if it is not treated through cold pressing or flash pasteurization. Next articleWhy Do I Get Cold After I Eat?